Would you love to have one place where parents can find your weekly newsletter, homework assignments, monthly calendar, reminders, and more? Would you like an editable weekly newsletter + much more you can edit in just seconds? With this editable parent communication Google Slides Smart Class Website template, you can! For a fun way to see how quick it is to edit your doc, edit this TpT Autograph Slide here, then check your edits right HERE. ☝Can't Decide? GET A LIFETIME LICENSE TO ALL PRESENT AND FUTURE SCWD THEMES. WHAT IS A SMART CLASS WEBSITE DOC? A robust Google Slides Presentation that keeps parents and students updated with important class information in real time! A document that updates easily and immediately. Add a change on any desktop or the Google Slides app on your phone and it will sync across all platforms in seconds. A lifesaver. *** My partner teacher and I reduced repetitive email messaging DRASTICALLY with our Smart Class Site. Answers to questions about homework, test dates, projects, etc. were all just a tap away on their smartphone. This freed up more time for more important individualized communication and teacher planning in general. WHAT DO YOU GET WITH YOUR SMART CLASS WEBSITE DOC PURCHASE? ☄EASY TO EDIT TEMPLATES. The following templates will make sure parent and student communication is top-notch! ✰ Alternative Homework Template. It contains five slides for each day of the week and is sized for interactive whiteboard display. Use this in conjunction with your website doc or by itself. ✰ Parent Handout Template. This handout will let parents know all about the class website and how important and helpful it will be for staying informed throughout the school year. ✰ Business Card Template. 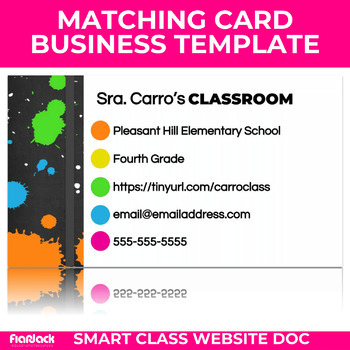 Give parents and students your class website link and other important info in a nicely designed business card format. ☄SLIDE DESIGNS. And apart from these, you can customize, delete, and add all the slides you need for your class needs. ☄INSTRUCTIONAL VIDEO TUTORIALS. They will help you make the process painless and fun. Subtitles are added as well. WHY IS THE SMART CLASS WEBSITE DOC SO HELPFUL? ✰ Parents and students can check your site on any computer or smartphone with one simple link. With everybody on their phones these days, reaching your students and parents on their mobile devices is a “smart" strategy. ✰ Have a partner teacher? Or do you team teach? You can both easily edit your site at the same time while keeping your students and parents informed. I am a teacher who loves my iPhone and saving time. I have often been frustrated with my performance at effectively relaying messages to my students' parents concerning homework, test dates, etc. This has resulted in lots of extra emails and phone calls to clarify assignments and due dates. I tried on several occasions to create a website to remedy this issue, but I always lost interest when the website became more trouble than it was worth. Then, in 2015 I discovered the ease of using Google Slides for various purposes in my classroom. I learned that I could use Google Slides to easily edit homework, newsletters, monthly calendars, and much more. ***The magic for me also came with being able to collaborate more effectively with my partner teacher. She and I edited the same docs at the same time and had them automatically appear in the class website. It was magical! This helped keep all of us on the same page and eliminated almost all nightly email answering. We saved SO much time with our Smart Class Website Doc and my hope is that more teachers will be able to do that, too. So, what does loving my iPhone have to do with all of this? Well, it is also a part of the magic of the Smart Class Website. With the Google Slides app, you can edit your website on pretty much any tablet or Smartphone. You can be waiting in line at the supermarket or riding a camel in Cairo while also updating your weekly newsletter or homework. It's crazy! 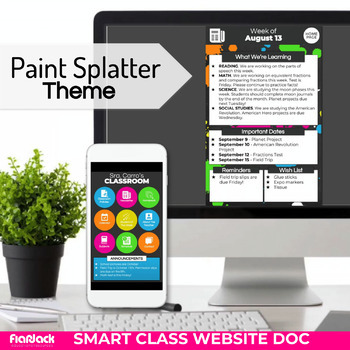 Hope you'll give a Smart Class Website Doc a go in your classroom! It's a great way to work smarter, not harder! Save time and streamline parent communication today!